Kevin and I are re-united and now residing in Lossu Village. We are grateful for opportunities to serve both the church and nation in Bible translation and literacy and education. 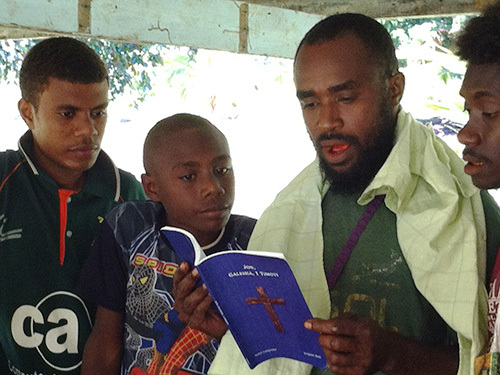 The Notsi people continue to buy the Scripture booklets (containing John, Galatians, and 1 Timothy). Local translators Wesley Kurang and Shirley Taupis continue to work with the Notsi Village Checking Committee on editing Luke’s Gospel. It seems that people are more excited than ever about getting the New Testament finished. We finished editing 70 Notsi hymns and look forward to printing a small hymnbook. People are eager to have the hymn book, too. The Lord is faithful about sending rain after recent dry spells and people are finding relief from stomach pains related to poor water supply. Katuben, (Shirley’s brother) who had withdrawn from the work and church seems to be back and engaging in Bible translation again. We praise God for these things. Our plans were to stay until the New Ireland Translation Institute courses start in mid September but we received word this morning that my mother’s health is declining. Her kidneys are failing, she finds it hard to eat or drink. The doctor says she has a matter of weeks. The time has come sooner than we planned and we are trying get home as soon as possible. Please pray that we can get tickets changed for a more immediate date and without extra costs. Similar heavies are being faced here in the village with Malis Lako, suffering with mouth cancer. Malis is a medical worker at a nearby clinic but has not worked in months. He is trusting the Lord for healing and we stand with him in prayer. He hopes to get to Port Moresby for surgery as soon as possible. In the meantime he is in constant pain. Matthew Lako, Malis brother, seems to be estranged from his siblings in a family dispute and is no longer working with Bible translation. We are praying for resolution of his personal issues, true reconciliation, mutual forgiveness and a return to the work. 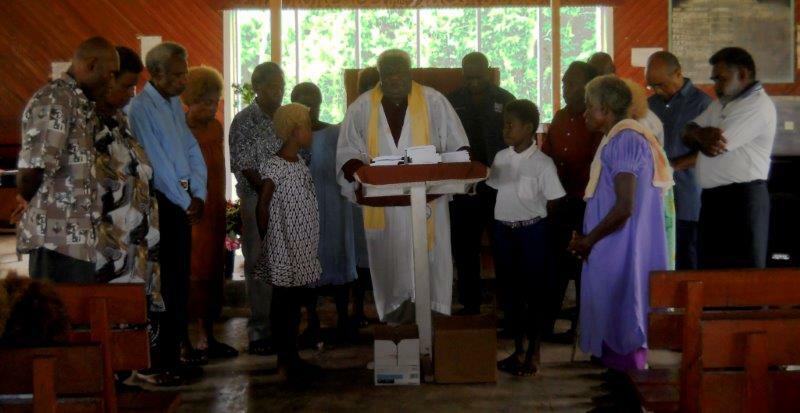 Since we returned to Papua New Guinea (PNG) in July I have been working closely with the Notsi translation team (Wesley, Matthew, Shirley, Paul Shaw and Katu) on a draft of the Gospel of John in Kavieng. Katu’s wife had just had another baby so he was not able to join us except for village checking. It was so exciting to be with most of the team working together on the Scriptures. As the Notsi translation advisor, I lead the team in a read through of the entire Gospel in Notsi–checking for accuracy and clarity of the translation. After making the corrections and edits, we developed an English translation based on the Notsi text. I was very encouraged to hear them engage with the text to determine the best way to translate it. Praise God! We were able to complete the first advisory checking process in October 2012 in Kavieng. In December we returned to the village and began the process called “Village Checking.” Each translator finds a group of people who have not been involved with the translation. Then the translators will read assigned chapters of the Gospel with the group and ask questions to make sure that the readers understand the passage and that it sounds natural in Notsi. One day I saw a group of young men sitting under a tree with Katu, near our house, so I went over to visit with them—among them a primary school teacher, a health officer, and two farmers. I asked if they would like to help Katu and I with checking the Notsi translation. We then spent the next three hours reading through John 3, the story of Nicodemus. These men were very eager to read the passage–pointing out corrections needed in the translation. They were full of their own questions related to the biblical text as well. We checked most of the chapter that day and they returned the next day to finish it. George and Debbie Bender returned to the USA and we returned to Kavieng manage the guesthouse again. We miss being in the village but thankfully we found a retired lawyer and a businessman that live close by. Wesley, the translator from Libba Village came to town that day and the two of us enlisted their help with village checking. They are willing to help on a regular basis.